Most people who choose to enter into careers in criminal justice and criminology do so because they're service-minded individuals looking to help others. Of course, they also want career stability, excellent training, and opportunities for advancement. There are few better places to get all of those than serving with the military police. The several armed forces of the United States employ both civilian Department of Defense police officers and military police forces. DoD officers and military police both perform functions similar to their counterparts in conventional police departments by providing base security, investigating minor crimes and traffic crashes, and enforcing portions of the Uniform Code of Military Justice on military bases. Military police, as opposed to DoD police, however, are subject to deployment overseas and into battle, and have expanded roles and responsibilities. Each branch of the armed forces has a military law enforcement component. These forces work closely with their branch's criminal investigative arm. In fact, serving in the military police corps can be an excellent jumping off point to an investigative career with one of the investigative divisions. Military police officers (MP's) are both soldiers and peacekeepers. This means that their job entails far more duties and responsibilities -- and is far more complicated -- than that of their civilian counterparts, both in the Department of Defense police ranks and local and state law enforcement agencies. MP's provide security services on military bases around the world. They also conduct law enforcement functions and take on investigations of minor crimes. Military police perform patrol duties, make arrests and enforce military law. Military police are also called upon to serve overseas and in battle situations. When deployed, MP's provide battlefield support, secure camps and outposts and assist in security details and dignitary protection. They also perform police functions in occupied areas and provide support and assistance to local police forces in maintaining order during and after wartime. Military police may also be trained to serve as corrections officers. They are tasked with maintaining order and security at the armed forces' briggs, prisons, and detention centers around the world. In addition, they are responsible for the detention of enemy forces during wartime. MP's also train foreign police forces and play a tremendous role in restoring order and rebuilding war-torn areas. MP's are a vital component of the mission of the armed forces and are involved in nearly every aspect of any major military activity. MP's have an extremely important and difficult job. 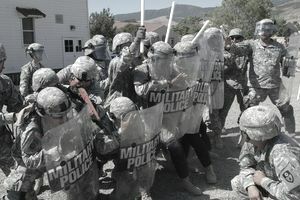 All law enforcement careers are dangerous, but military police must deal both with normal dangers associated with policing and those encountered on the battlefield. When not serving on base, they work in harsh environments and live in rough, undesirable conditions. Military police officers must be at least 18 years old and they must be enlisted or commissioned in one of the four branches of the United States military. They must be eligible to receive a confidential security clearance, which will require a background investigation. To be accepted into military police training, prospective MP's must have a relatively clean past, with no criminal record or prior history of drug use. MP's receive extensive instruction in law enforcement techniques and tactics after they complete basic training. Once they complete all of their training, they are assigned to a military police unit and may be deployed anywhere in the world. Due to the expanded role of military police officers, as well as protracted military operations around the world, there continues to be a strong need for MP's. Opportunities abound within all branches of the military for those who are up to the challenge. Is a Career as a Military Police Officer Right for You? A day in the life of any police officer is tough, but it can be that much more so for military police. This is definitely not a job for just anyone. Military life can very very rewarding, but also quite difficult. It is also a tremendous commitment. Unlike other careers, you can't just quit the military. Any decision to enter into a career as an MP should be undertaken with sincere and thoughtful consideration. For those who are up for it, though, working as a military police officer can be a rewarding career in its own right, or it can be a wonderful stepping stone on your way to other great criminal justice jobs. A military police career can provide valuable and indispensable experience for any civilian or federal law enforcement job.